Through creative writing, Denise encourages the individual to traverse the unknown and to start a journey into the world of soul. The place inside us longing to discover, inquire, solve mysteries, be surprised, awaken to passion or live in a place of fulfillment and purpose. The feather on the cover seems to be symbolizing the individual or perhaps a writing tool through which we communicate. I also think this symbolizes our ability to fly. This illuminating guide while help you live a more soulful life. 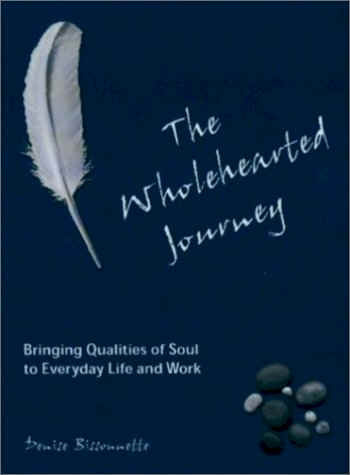 “The Wholehearted Journey” will encourage you to leave your path in the world of the mundane and fly in the world of inspiration. The experience while reading this book is similar to being captivated by a speaker who has found a way to communicate with your soul. In fact Denise is an internationally renowned writer, impassioned trainer and speaker. In this work, she draws on an eclectic array of sources. Her work is also enriched with quotations from inspirational writers, teachers, poets, spiritual leaders and philosophers. There are over 500 quotes! There is nothing I love more than to find a book filled with stories, quotes, poems and divine metaphors. Denise is not only a poet when writing her poems. The way she sees life is truly beautiful. Denise starts each chapter with an original poem, she then reflects on the concepts presented in the poem and presents additional passages and quotes for reflection. There are stories which present profound wisdom in only a few lines, quotes teaching truly interesting concepts and insights to inspire you in your own writing or journey. There is a page after each chapter for your own notes. Her original poems are something she receives, not something she crafts. That is very true when writing poetry. While many poets seem to be writing in a code only they understand, Denise’s poems are written with an open heart and a focus on reality. Her creativity spills onto the pages in a refreshing stream. Her focus is not only on the outer world. She has an honest and deep desire to share what she has learned so the reader can enter the inner world. The place where your most important journey occurs. the uncharted seas of our lives, alone. yet, blessedly, together, side by side. What makes this book truly life changing is the “To Ponder and Practice” sections. After reading each chapter you have the opportunity to reflect on your own life and make notes that will guide you to a more fulfilled existence. Through the chapters, you will learn how to live in the hear and there, dedicate your days, put your imagination to work, kick the habit of comparison, embrace your limitations and potential, celebrate the differences of your gifts, believe in invisible forces, befriend the dragon, soar on wings of choice, take the unknown one piece at a time, claim your power, seize the present day, rest in the warm pockets of the world, harness the power of perspective, recognize your teachers, cultivate joy, refuse to be tamed by the world, practiced compassion, make balance a priority, recognize your path and so much more! I especially enjoyed the “lessons from the apple tree” because my grandmother always made pies from an apple tree in her backyard. There are actually two parts to the poem in this chapter. One is written by Denise and one is “humorously” written by the Apple Tree. In this same chapter, Denise gives us one of many gifts. She retells a story she told to her daughter about a rose bush. I found this interesting and meaningful as my grandmother’s yard was also filled with rose bushes. I spent about five evenings reading this book and found it to be healing and inspirational. Each evening I climbed into bed and lost myself in the pages for hours at a time. You could also read one chapter a day for 20 days or only read one chapter a week. Once you start reading this book, it will be difficult not to want to keep reading all night long! I think this book will come into your life when you need it most. Don’t all books arrive just when you need them? I am definitely going to add many of the books the author mentioned to my reading list. In fact, while reading this book, many things were going on in my life and I found it very interesting how I would read a chapter and feel as if this book had been sent to me by an angel to help me understand certain situations. Part of the beauty of many books is the thoughts you have while reading them. This is a book that will inspire you to think beautiful thoughts. Denise Bissonnette’s poems are also available on CD titled: “Poems for the Wholehearted Journey.” I would encourage you to also find the CD as it added to the entire experience. Denise reads her poems beautifully and her voice is calming and her interpretation is inspiring. For spiritual beings desiring a more fulfilled human experience. When you start reading the introduction, you will be amazed by the depth to which this book will take you. This is not a dry how-to-find-a-job book, this is about finding a soul-satisfying vocation. It is about finding work that not only provides a sense of purpose, but allows us to express our values, talents and strengths. The two main ideas of “What Next” include developing an independent attitude of being who you are by expressing your authentic self and acknowledging that a good job is a right, not a privilege. Dr. Barbara Moses is a career expert who shows people how to uncover the core themes of their present jobs and find a career to help them become an expert in their field. She is known as a “career guru” and her widely-read career column in the national Globe and Mail shows her deep love for career activism. Find out why career decisions can be distorted by unhealthy attitudes about money. Know how to express your authentic self in any work situation. Find the information on how to avoid being a victim of age discrimination. Overcome fear and learn to find work in tough times. 1. Know Yourself – The author starts with you, not with a list of jobs you might be interested in. First, you find out who you are. It was enlightening to discover my core needs in relation to the work environment. Do you want to change the world? Help people become more successful? Become famous? This is a book you will want to save. Throughout each chapter, you can record your thoughts about career issues. If you don’t know who you are by page 85, I can tell you, you never will. This is simply brilliant information. 3. Find Great Work – Finally you know who you are and you have your areas of interest all mapped out. Now you create a powerful resume and cover letter and start interviewing. There is also information about what to do or not do when you lose a job. You will find out what employers are looking for and discover how to “net” a job. There are samples of a chronological and functional resume. The interview section is quite interesting. I’ve been asked some pretty tricky questions that I would have understood more fully had I discovered this wonderful resource near the time of the interview. 4. Overcome Career Challenges – If you have started to feel that your work is meaningless, you might be going through a career crisis. This chapter discusses everything from being fired to overcoming boredom and burnout. Are you feeling unfulfilled or do you have to deal with a difficult manager? 5. Boost Your Career Intelligence – Learn how to market yourself, overcome networking angst and be kind to yourself. Throughout this book you will also find diagnostic instruments, guided exercises, quizzes and easy-to-follow samples, models and worked examples. 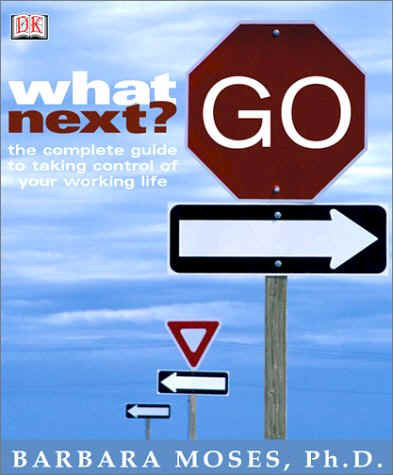 “What Next?” is an insightful look at how we can select a fulfilling career. Barbara Moses gives you the power to find your dream job in a contemporary employment landscape. This has to be the most exciting book on employment I’ve ever encountered. "Researchers have demonstrated that a feeling of community reduces suburban depression." The first pictures I observed upon opening this book were of a lovely neighborhood in much need of comfort and the beautiful results after the streets had been lined with trees. Sidewalks had also been created and pathways up to each front porch created a very inviting environment. The trees shaded the walkways and people enjoyed riding their bikes down the streets. The contrast was eye opening and the results very comforting. You can imagine the people living in this area finally feeling like they were home. Suburban Revitalization I: Can This Dream Become a Reality? 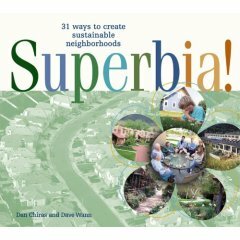 This book helps to emphasize the isolation of the typical suburban house and shows how the community design seems to emphasize private space instead of community. This promotes a lack of connection. Could the way we live promote depression and a lack of friendships? Could the way we build communities lessen domestic violence, encourage community interaction and promote a general feeling of well-being? Like Feng Shui, this book gives ideas for building or restoring neighborhoods to promote happiness and to reduce stress. While some say we are not a product of our environment, it only takes a little research to find out that where there is more hope and a greater sense of community, humans seem to thrive. The transformations in communities is revealed in pictures that explore the role of nature in our comfort level. Would you rather live behind high brick walls or enjoy a more peaceful and serene landscape of short fences and flowered walkways? In one section, an alleyway between living spaces is transformed into a little piece of heaven. As a child, I remember two types of homes. One with a backyard, tightly fenced in, and another with wide-open spaces and easy access to walking through community spaces. I can tell you, I preferred the latter. This book is filled with wisdom and great advice for city planners and I've seen the idea of producing an edible landscape work efficiently in some areas. As a child we used to pick fruit off trees on the walk home from school. It is a dream that can come true and this book has many ideas that once implemented will improve the lives of everyone in the community. By reading this book, you may also decide to move to a location that values these ideas.